So, I’m just going to go ahead and say I generally live by the “don’t judge a book by its cover” rule, but every so often I get lured in by some fantastic cover. Come on, we’re all guilty of doing it at some point. In this case, I saw the cover, drooled a bit, and decided I absolutely needed to read this book before I even read the synopsis….what can I say?…cover dude is hot! I’m not actually sure the cover was a great match for the story, but it’s schmexy as all hell and definitely got my attention, so no complaints here. I wasn’t disappointed with this read, it’s engaging and heartbreaking at times, but there were a few things I felt could’ve been a bit more developed. Luke Cawley has probably been living the worst year of his life. A year after the death of his wife, he’s still trying to cope with the loss. 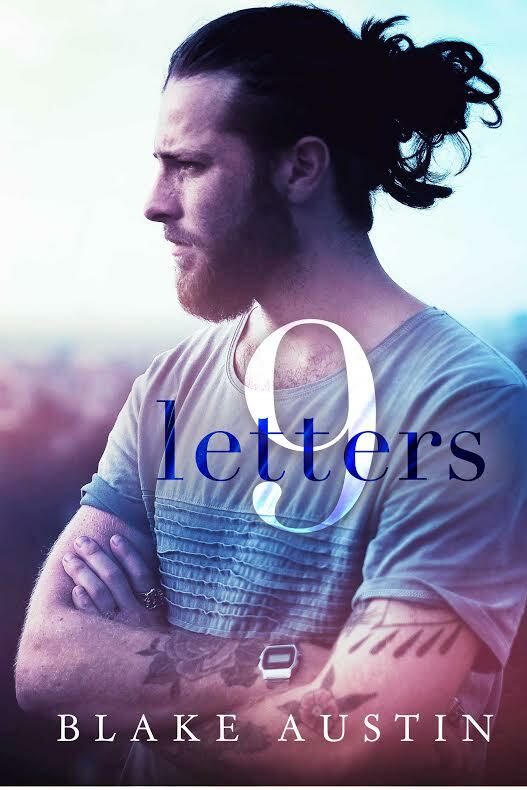 His guilt, shame and anger torment him, but when the letters arrive he starts to feel alive again and he begins to gain a semblance of hope that things will get better. 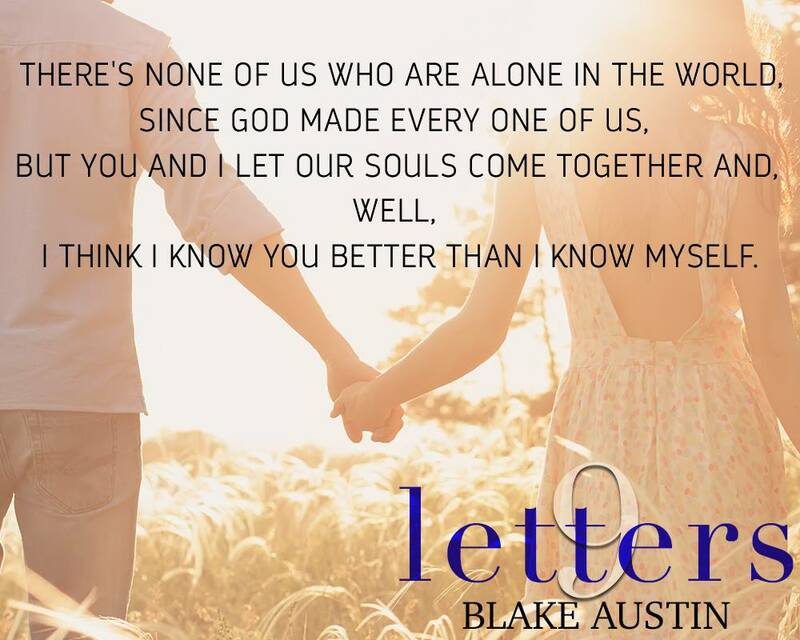 What I loved most about 9 Letters was the rawness, the honesty and the grieving process that brings us on a journey with Luke. Sometimes an ugly, angry journey, sometimes a sad, heartbreaking one, but by the end you see how far this man comes and you will absolutely fall in love. 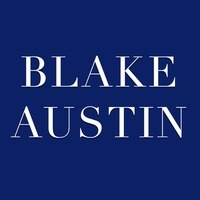 Seriously though, this book was a pleasant surprise from a new voice and I am excited to see what Blake Austin has in store for us next. 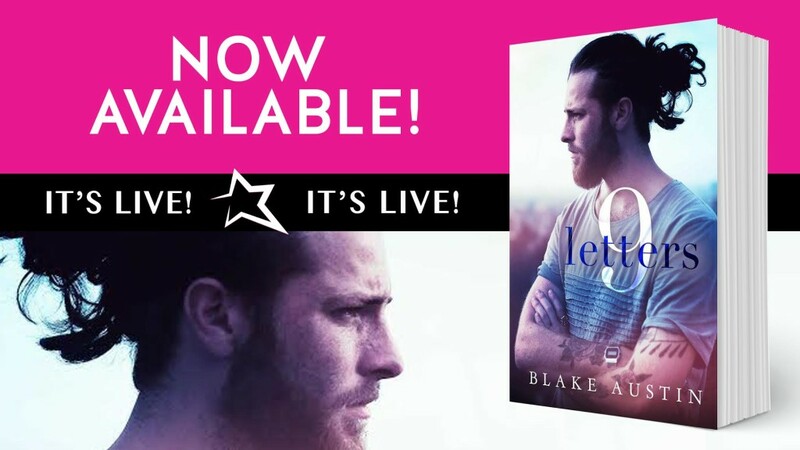 9 Letters gut punches you, but it connects you with Luke almost instantaneously. 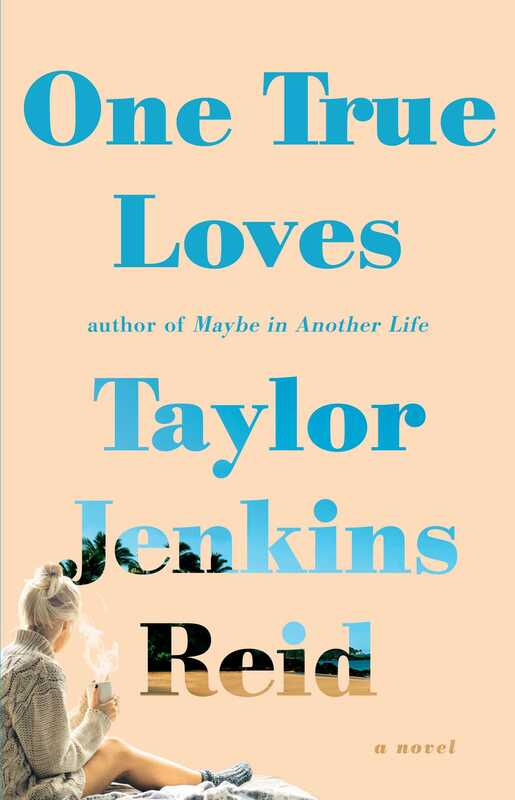 I read it in one sitting and it is probably the most honest fictional writing about the grieving process that I’ve ever read. You’ll love Luke. His story will leave you optimistic and reflective. As he begins to weave his way into the light you’ll hope that he will find a way to reconnect with others — especially Rae. 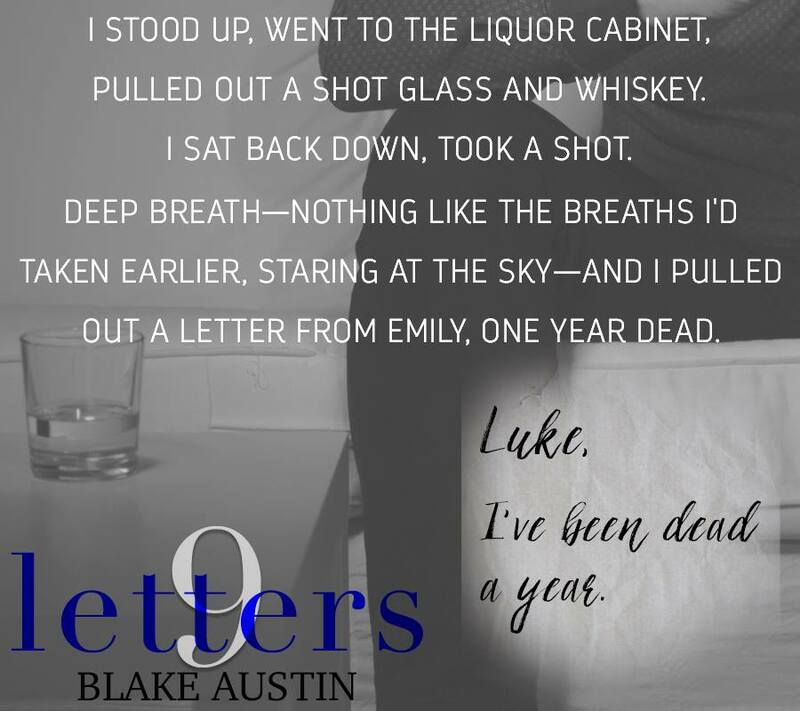 9 Letters has elements of romance, but it also is a powerful story about love and loss and through these letters you see that even in death love is the most powerful voice of all. I thoroughly enjoyed this read. I pretty much devoured the book. I finished it in one sitting. What would you do if you partied so hard you couldn’t remember anything about your night? Would you freak out when you notice a hot guy in the room, nursing your hangover? Evelyn Thomas wakes up with one hell of a hangover and one hell of a rock on her finger. Scratch that, a five carat Cartier to be exact! 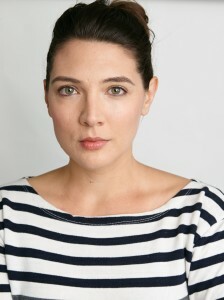 She doesn’t remember anything about her night with David Ferris and doesn’t remotely recognize him for his fame. Without so much as a second thought she freaks out…too shocked to think long enough to ask any of the right questions she suggests an annulment. David is seemingly upset by this, but agrees to have his attorneys contact her and draw up the papers. Although upset, he leaves slamming his way out of her life. A quickie annulment should solve all their problems, she could go back to her life and stick with her carefully mapped out plans. Simple enough right? Wrong! Upon returning home to Portland, OR she is rudely awakened by reality and just how drastically her life will change courtesy of her wild night in Vegas. 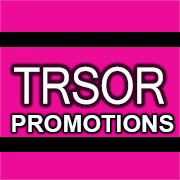 This book is slated for release on July 1, 2013. A blackbird had been inked into the side of his neck, the tip of its wing reaching up behind his ear. I still had on my pretty white party dress, compliments of Mom. But he wore just a pair of jeans, some scuffed black boots, and a loose white bandage on his forearm. Those jeans … he wore them well. They sat invitingly low on his hips and fit in all the right ways. Even my monster hangover couldn’t detract from the view.